World’ s Best Quality Meerschaum. 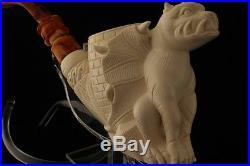 GARGOYLE Meerschaum Smoking Pipe by I BAGLAN 2605 +CSE. Move mouse over images to see larger version. THANK YOU MY DEAR FRIEND BAGLAN FOR MAKING THIS BEAUTIFUL PIECE OF ART AND THANK YOU FOR GIVING ME TO SELL THESE PE. RFECTION PIPES OF YOU FOR THESE REASONABLE PRICES. NO SYNTHETIC PAINTING NATURALLY WAXED BY BEE’S WAX. Length : 19.00 cm=7.48. Height : 8.70cm=3.42. Width : 4.50cm=1.77. Bowl Diameter: 20mm=0.79. Be sure to add me to your. ABOUT THE MASTER CARVER I. Ismail Baglan was born at 1953 Eskisehir Turkey. He has been carving for over 30 years since his teenage years. He always used the best quality meerschaum stone and always made the best carvings all over the years. What would you expect from a carver who makes a smoking pipe for you? A good carftsmanship that would make you enjoy your pipe without any trouble for many years? A good talent that would get you surprised after every bowl? A good personality that would make you feel that your pipe has been made by a member of your family? Rest assured, Ismail has these all, at least. I would greatly recommend you possess one of his excellent pipes if you like to experience what I was trying to express. Meerschaum market is his offical licenced e-bay outlet. Meerschaummarket’s exception would be that I have a direct contact with him to call his special attention to my requests as he kindly since now. YOU CAN SEE I. BAGLAN’S LATEST PHOTO AT THE LAST PICTURE OF THE PRODUCT. And be informed from the master pieces and new items. GENERAL INFORMATION ABOUT MEERSCHAUM PIPES. Meerschaum is a very rare mineral, a kind of hard white clay. Light and porous structure of the pipe keeps the smoke cool and soft. The pipe itself is a natural filter which absorbs the nicotine. Meerschaum is the most flavorful and beautiful pipe you can own. Because of this peculiarity, meerschaum pipes slowly change their colors to different tones of gold and dark brown. This adds an esthetic enjoyment to its great smoking pleasure. The longer a pipe is smoked the more valuable it becomes due to the color change. Today many old and rare meerschaums have found a permanent place in museums and private collections. Pipes are made of high quality Eskisehir Meerschaum which is very well known by experts. Unlike briar, meerschaum does not burn. Meerschaum pipes do not need pre-smoking to have a good quality performance. You can get perfect satisfaction with the very first smoking. Unlike a briar pipe, which must be dried after each smoke, the meerschaum can be smoked many times a day because of its absorbing qualities. Every pipe comes in a completely custom fitted case. Allmouthpieces and pipe-cases are handmade individually after the production of the pipes. Each pipe is a hand crafted art of the masters. It will take 3- 5 days to USA and 3-5 days to Europe and 15-20 days to the other countries. It will take 15-20 days to USA and 3-5 days to Europe and other countries. All sales are final. The photos and the sizes are realistic and each pipe had been photograhed individually. You will get exactly what you see and same sizes that are declared. Also we inspect each item very carefully for any defect or crack. Our company had been making meerschaum tobacco pipes generation to generation since 1974. Track Page Views With. Auctiva’s FREE Counter. The item “GARGOYLE Meerschaum Smoking Pipe by I BAGLAN 2605 +CSE” is in sale since Monday, September 05, 2011. This item is in the category “Collectibles\Tobacciana\Pipes\Meerschaum”. The seller is “meerschaummarket” and is located in Eskisehir TURKEY. This item can be shipped worldwide.